LOS ANGELES (KGO) -- From former San Francisco 49er Terrell Owens to former Raider Tim Brown to WWE star Ric Flair, ABC7's Larry Beil chatted it up with a variety of sports celebrities on the 2016 ESPY Awards red carpet. Click here for full coverage on the ESPYs. 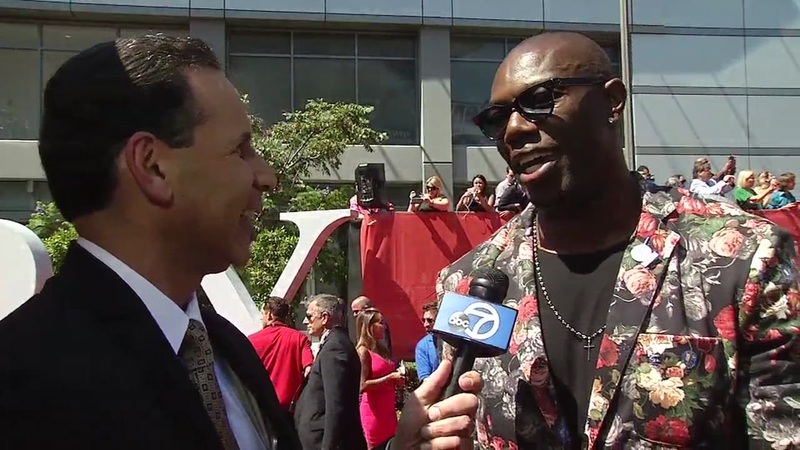 Former San Francisco 49er Terrell Owens talked to ABC7's Larry Beil on the ESPYs red carpet. Former Oakland Raider Tim Brown talked to ABC7's Larry Beil on the ESPYs red carpet. Transgender advocate and triathlete Chris Mosier talked to ABC7's Larry Beil on the ESPYs red carpet. Stanford football star Christian McCaffrey talked to ABC7's Larry Beil on the ESPYs red carpet. Cleveland Cavaliers star Kyrie Irving talked to ABC7's Larry Beil on the ESPYs red carpet. Charles Barkley talked to ABC7's Larry Beil on the ESPYs red carpet. WWE star Ric Flair talked to ABC7's Larry Beil on the ESPYs red carpet. NBA Commissioner Adam Silver talked to ABC7's Larry Beil on the ESPYs red carpet.